All prices are based on a PER ROOM, single OR double occupancy basis, one OR two beds. $10 per night is added for the 3rd and/or 4th person over the age of 12 (four persons per room maximum) sharing the same room. At least one person occupying each room must be 21 years of age or older. Current Las Vegas room tax is 9%, which is added to your total. All prices are based on availability and are subject to change without notice prior to actural booking. Persons 12 years old and under are free. Rates charged for persons over the age of 12 is $10 per night each. Use of crib bed is free (and based on availability). 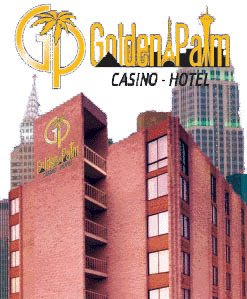 Note: Due to rapidly rising energy costs, the Golden Palm Hotel Casino is imposing a $3.00 per room per night energy surcharge. All hotel guests will be required to pay this energy surcharge upon checkin. Your credit card is required to make reservations. You have a choice, you can either PREPAY or GUARANTEE your reservation online or through our Call Center. PREPAID Reservations require that the full amount be charged to your card at time of booking. Charges to your card for PREPAID rooms will be reflected on your credit card bank statement from our service partner: FUNTYME RESERVATIONS. GUARANTEED Reservations incur no immediate charge. Your card is required to Guarantee your rate and reservation. No charges will be applied until 2 days prior to arrival date, at which time your card will be charged for the 1st night plus tax, each room booked. At that time (2 days prior to arrival date) the 1st night plus tax, each room booked, becomes a NON-REFUNDABLE DEPOSIT. The balance for your room(s) will be charged/collected at the hotel (see Cancellation & Changes below for no-show charges.) Charges to your card for GUARANTEED rooms and/or incidentials you charge to your room during your stay with us will be reflected on your credit card statement from Golden Palm Hotel Casino. PREPAID AND GUARANTEED Reservations are exactly the same room assignment except for price and method of payment. Golden Palm Hotel will detail the exact charges you can expect for your room(s) and the Cancellation period for your reservation. This will also be included in your written email confirmation. Golden Palm Hotel accepts American Express, Visa, Mastercard, Discover, and Diners Club. Cash payment at the hotel is an acceptable form of payment for GUARANTEED reservations only, but your reservations must be secured by credit card and the CardHolder with picture ID must be present during checking-in. Note: All dates and times begin and end at midnight Pacific Standard Time. GUARANTEED Reservations: 2 full days notice prior to arrival date is required for cancellation without incuring a penalty, otherwise your card will be charged for the first night, plus tax, each room booked (NON-REFUNDABLE DEPOSIT). There is no cancellation penalty when canceling a GUARANTEED reservation 2 or more days prior to arrival date. For clarification, if your arrival date is the 28th of the month, 2 full days prior to arrival date is on the 25th of that same month, the non-refundable deposit occurs on or after the 26th. PREPAID Reservations: 5 full days notice prior to arrival is required. A $20 cancel fee will be assessed for all rooms canceled 5 days or more days from arrival date. Between 4 and 1 days prior to arrival date the first night plus tax, each room, is non-refundable. 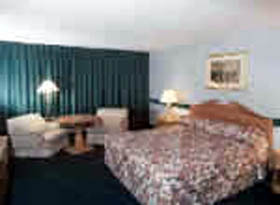 On date of arrival (12:01 AM) the full amount plus tax, each room, is non-refundable. No-show (not checking-in by 12PM (midnight) on the date of your scheduled arrival) is NOT a cancellation, and all cancellations must go through this website. If you know you will be arriving later than 12AM (midnight) note that in the special requests box of the reservation form, or call the hotel directly at 1-702-798-1111 (ask for the Front Desk). Or, call FunTyme at 1-800-537-6986 or 1-702-636-9507 before 12PM (noon) on the date of your arrival. There is NO charge for changes to reservations either GUARANTEED or PREPAID. However, we cannot pre-guarantee availability or rates for the desired additions. Examples of Changes are: add a room, add a room-night, add or subtract persons sharing a room, change "share-with" name, change the number of beds requested, change Type: i.e., smoking/non-smoking, add or subtract a rollaway, crib bed, etc. All dates and times begin and end at midnight Pacific Standard Time. Note: Except for price, between GUARANTEED and PREPAID, there is no difference in the room you are assigned during check-in. For all Internet related products and services Golden Palm Hotel Casino, Las Vegas, is DBA (Doing Business As) GoldenPalmLV.com. 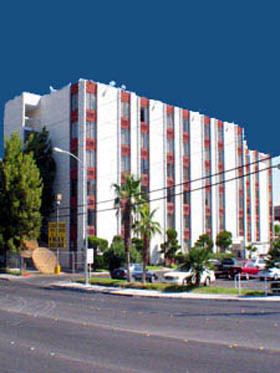 Golden Palm Hotel Casino, and any of its companies, agents or subagents shall not be held responsible for loss, damage or injury to property or persons, due to any defect or negligence by any hotel employee, airline, automobile rental agency, or any other company or person providing the aforementioned.